The document emphasizes various preventive measures, as well as cultural and educational events. The government of Russia has developed a special, 82-point plan to deal with inter-ethnic conflicts. Among the proposals put forth by ministers are: the funding of nonprofit organizations involved in the integration of immigrants; the organization of several cultural festivals and seminars; and even the introduction of classroom curricula on the culture of inter-ethnic relations. This is the first large-scale document on ethnic policy in over 50 years. Immediately following large-scale disturbances tied to ethnic strife in Saratov Region’s city of Pugachev, the Cabinet of the Russian Federation approved a strategy on ethnic conflict resolution. The adopted "Strategy of the State National Policy of the Russian Federation for the Period through 2025," written by the Ministry of Regional Development, includes 82 points in various areas — from culture and education, to security. First and foremost, the strategy stipulates that the government will have to develop a federal program to support the unity of the Russian nation and the strengthening of ethno-cultural nations by 2020. Corresponding documents will be developed for the regional governments, as well. For the representatives involved in the implementation of this document, a special training program will be developed. There is also a plan to train specialists at foreign educational institutions in inter-ethnic relations. In general, education is one of the main tools mentioned in the strategy. In particular, pre-schools, grade schools and universities will have a new subject: "culture of inter-ethnic relations." Also included in the document are scheduled youth activities. For example, there are the summer political science schools and youth education camp at the "Ethnomir" complex located in Kaluga Region; there are also sporting events planned. As part of the strategy, several TV programs and documentaries about the people of Russia will be created. Most activities fall on the cultural side — festivals, celebrating anniversaries, exhibitions in museums and youth festivals. Along with the Days of Slavic Written Language and the 700th anniversary of the birth of Orthodox St. Sergius Radonezhsky, the celebration of the 150th anniversary of the migration of Koreans to the territory of Russia will also have support from authorities. It is not completely clear yet how this will fight conflict, but the government plans to develop a certain methodology for the identification and elimination of conflicts. In addition, according to the order, the government plans to amend some legislation. For instance, the strategy touches on the law regarding order at sporting events — most likely because, among sports fans, there are often conflicts based on ethnic hatred. For example, riots took place in Moscow on December 11, 2010, when nearly 5,000 people gathered on Manezh Square following the death of a Spartak soccer team supporter, Yegor Sviridov. The young man was killed during a fight that took place on December 6, 2010, between a crowd of soccer fans and a group from the Northern Caucasus. In the investigation of the murder, law enforcement was perceived by society as covering up for suspects who triggered the protests. 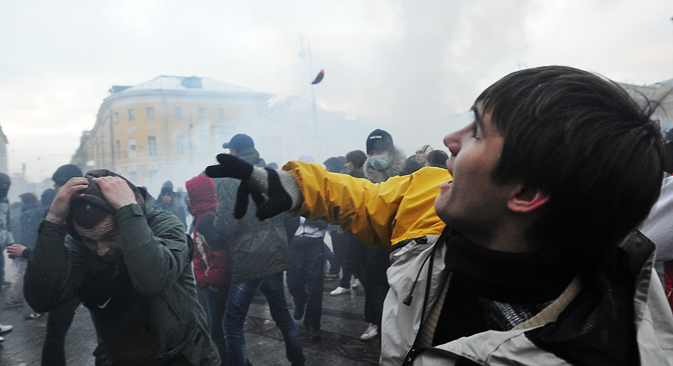 The rally on Moscow's Manezh Square escalated into clashes with police. The riots affected more than 10 people, and a few dozen fans were arrested. After the riots, a series of mass demonstrations took place, leading to street fights with natives of the Caucasus republics living in the Russian cities. Among the government proposals there are also regulatory measures. The document states that activities of public associations, religious and other nonprofit organizations will be audited, in order to identify evidence of extremism on ethnic or religious grounds, as well as the spread of extremist ideology and literature. Particular attention will be paid to these organizations’ sources of funding. It is also planned to financially support nonprofit organizations that are engaged in inter-ethnic relations — the government will even support student and volunteer movements. Additionally, in the framework of the document there is a plan to run several monitors of the strategy, to carefully observe the balance of inter-ethnic issues in employment and keep track of pre-conflict situations. Aslambek Paskachev, chairman of the presidium of the nationwide public movement "Russian Congress of Peoples of the Caucasus," participated in the preparation of the strategy and is confident that the main thing now is to finance the program in its entirety and begin implementing it. "This is the first strategy on national policy in 50 years. For the first time, [there is] a full program aimed at preserving the integrity of the country, vis-à-vis inter-ethnic relations. All of these issues were separately raised before; but they were engaged in various ministries and departments, and so there was no coordination,” said Paskachev. He expert noted that work on the national question must be of an accord with the work of nonprofit organizations, and it is good that support of these organizations is built into the strategy. In addition, Paskachev agreed that the cultural component is important and deserves the attention it is receiving. "For example, in the youth environment, it is exactly a familiarity with other cultures that gives a sense of security. By itself, the festival will not solve conflicts, but it gives an understanding of other nations,” Paskachev said. However, the expert mentioned that, even with the detailed measures of the 82 points, the strategy will have to be changed and supplemented. Valery Khomyakov, general director of the Council for National Policy, is sure that, for the normalization of inter-ethnic issues, it is important to fight corruption and to not allow officials to infringe upon the rights of either migrants or locals.